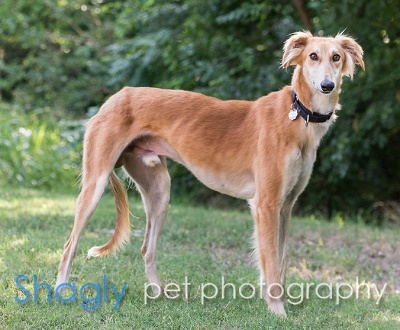 George is estimated to be a three year old red greyhound/saluki mix. George arrived with Classy, Laura, Lyndon, Lady Bird, Etta and Butch from a horrific cruelty seizure in West Texas. He is in stable condition with a very low platelet count, a positive titer to Ehrlichia Canis, as well as a large load of intestinal parasites. His weight at this time is 56 pounds. George has passed a cat test, but has not yet lived with them in a foster home. George is on medication for his Ehrlichia Canis as well as his parasite load. His platelet count has risen, and his bloodwork will be rechecked in several weeks. 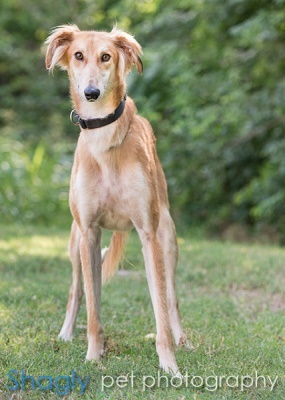 George has been successfully treated for his Ehrlichia Canis as well as his intestinal parasites, and he has completed all his medical procedures! This boy is ready to find his forever home! The special medical treatment cost needed by George is why the Miss Mesa Fund was established. If you would like to help with George's care, please take a moment to make a donation to the fund. You WILL and CAN make a difference in George's life and the lives of other greyhounds in need of special medical care. Your help and support will make a difference - one greyhound at a time. Please note 2016 Grant Challenge/George on your check.